With our event template, you get a checklist that you can also manage on a timeline, invite vendors to, and communicate with your team in. Event planning is stressful. With dozens of deadlines and details to track, it’s easy for something to slip, putting your event at risk—especially if you’re managing plans in several tools. While a detailed template will help you save time planning events, putting it in a tool like Asana maximizes productivity and clarity you just can’t get by planning in spreadsheets and shared docs. Access plans no matter where you are. Employees on-site or traveling can find everything they need in one place on and offline with our mobile app. Prevent miscommunication and silos. See and share progress right from the template instead of calling more meetings and pinging teammates for updates. 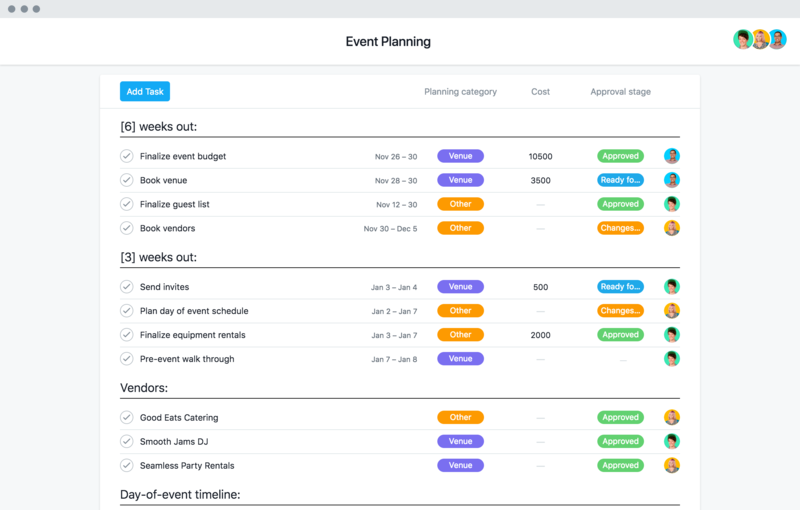 With Asana templates as your source of truth for event planning, you can focus on managing unforgettable events instead of managing to forget a step. Stay on top of everything instead of feeling buried with tips from experts at Asana and Eventbrite.